A slightly spicier take on a simple classic. The rendered fat from the chorizo plays nice with the vinegar to dress the pasta. 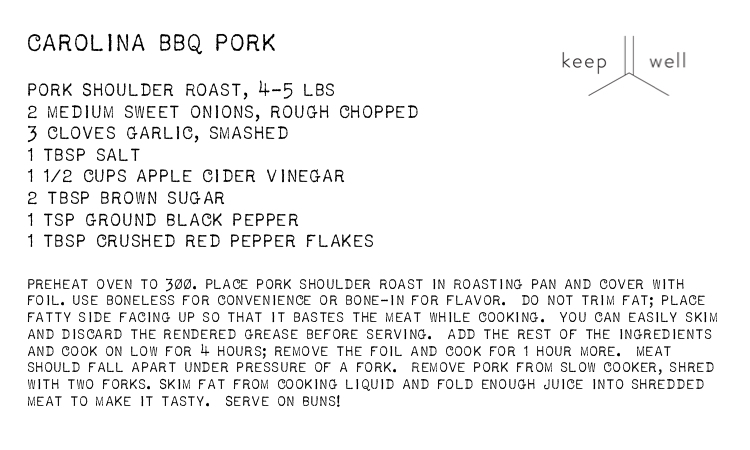 We knew we had to do this once we found out the Organic Butcher was making chorizo with our apple cider vinegar. A versatile dressing, served warm. Nutty sweetness from the brown butter complements the caramelly aroma of the sorghum molasses vinegar. Try it over roasted squash or sweet potatoes! 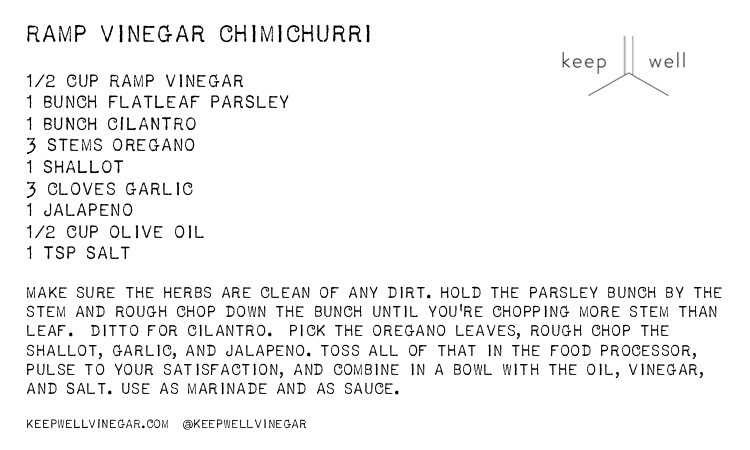 Chimichurri is traditionally used as a steak sauce or to marinate quick cooking cuts of beef, like skirt or flank steak. 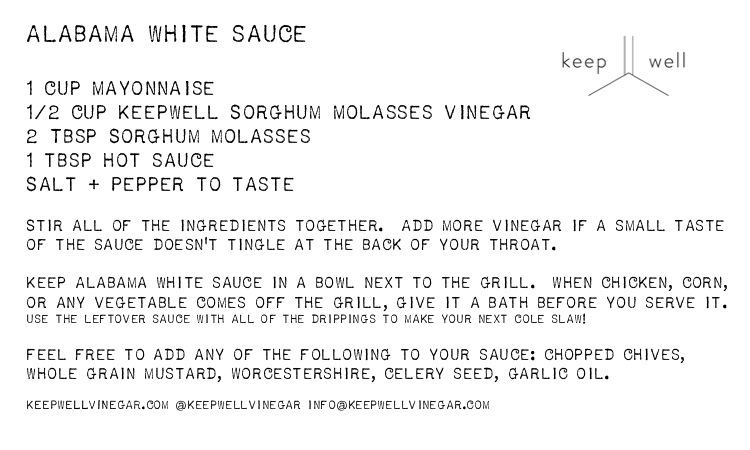 It’s one of the best and most versatile ways to show off a great vinegar, so don’t hesitate to put it on everything. 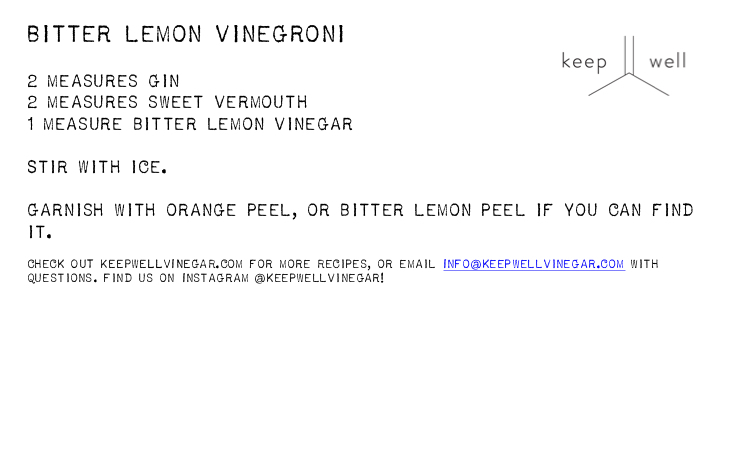 Make it with bitter lemon vinegar to use on grilled whole fish, or with aronia berry vinegar to dress a chunky salad. Alabama white sauce is an excellent barbecue tradition. 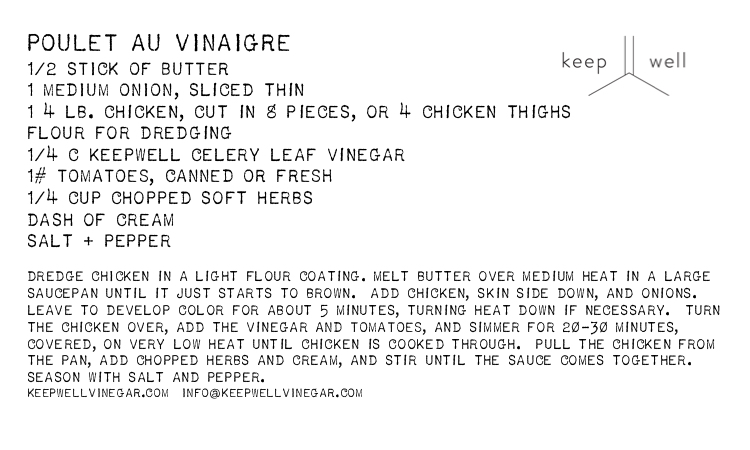 Whisk up a bowl of this tangy mayo-based dressing, and baptize your chicken (or whatever you’re cooking!) with it as it comes off the grill. Here we’ve used it to coat some grilled corn to make elote loco! Our bitter lemon vinegar carries a beautiful, pithy citrus bitterness that is very evocative of negronis. Try this version, hopped up on acid and without the extra sugar from the liqueur, and you’ll realize for the first time just how sweet the classic cocktail is. Chutney might sound very different and challenging, but it’s not - especially our casual little version here. As written, it’s very nice with cheddar (especially in a grilled cheese), but you can try it with any of our fruity or spicy vinegars, like concord grape or ginger. Eat it like a pastry, eat it like a tart little rugelach. Possibly an old Polish tradition? We’re not sure, but we are seriously impressed with the sticky caramel that reduces in the baking dish. Roll a few thin apple slices or a handful of chopped nuts right up in the dough. Chicken and vinegar. But in French. The acid from the vinegar helps the cream and butter emulsify, and the chicken is dropping juice as it simmers, creating a sauce that is more than the sum of its parts. There are lots of strong feelings about Carolina barbecue; we’re fully aware that we’re presenting one of many points of view. 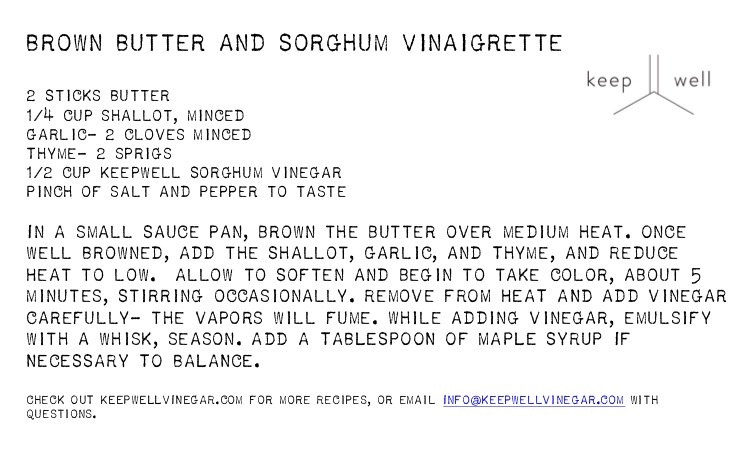 We’re just excited that this recipe is such an awesome way to use a wide variety of vinegar flavors. Cider is traditional, but don’t let us stop you from using ramp vinegar, or sorghum vinegar, or any flavor your heart desires.